Plan, Launch, Manage and Protect the Innovation Project in your Organisation. 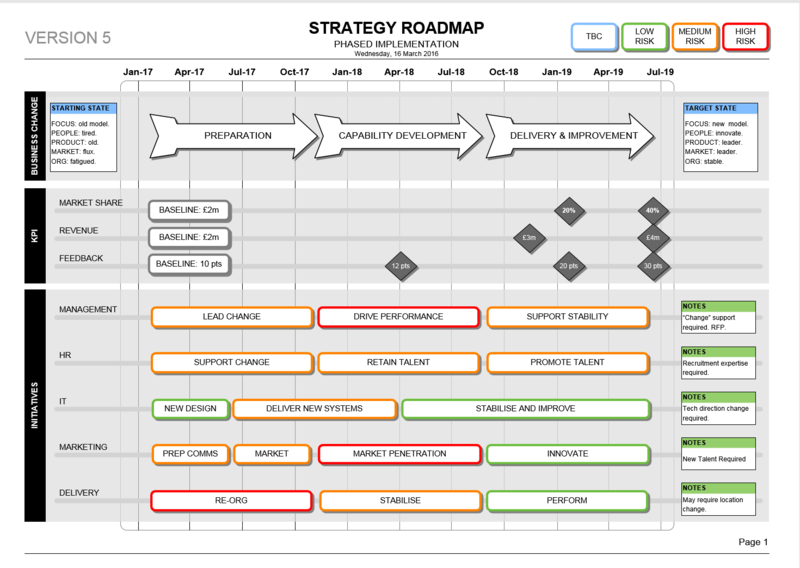 This Innovation Roadmap Template is perfect for strategic planning and professional presentation. Using the Innovation Roadmap Template. It’s a simple Powerpoint format. You can easily edit the slides using normal Powerpoint tools to meet your requirements. Then present it to your colleagues! 1) PREPARATION PLANS. Used to prepare your organisation for a new way of working. COMMS: What Stakeholders will need to communicate. BENEFITS: What the Organisation is getting out of the project. ACTIONS: What the Stakeholders need to do in support. These innovation preparation templates are useful if your stakeholders are new to innovation projects. The preparation templates get the difficult conversations out of the way before you start discussing timelines. 2) INNOVATION ROADMAP. Used to lay out the strategic plans on a timeline. TIMELINE: Set to 2 years, and you can change to suit your project. FSNP: Forming, Storming, Norming, Performing. This is used to manage expectations. KPI STREAM: Show what you are going to be measuring through the project. THEMES STREAM: This shows the high level subjects that the innovation project will explore. THREATS STREAM: These are the items that need to be managed and mitigated. When should I use this template? … (the list goes on). Get helpful guidance from the template notes. Available in 4:3 and 16:9 Powerpoint Formats! Rating for Innovation Roadmap Template (Powerpoint) Template: 5 out of 5 , based on 2 customer reviews. 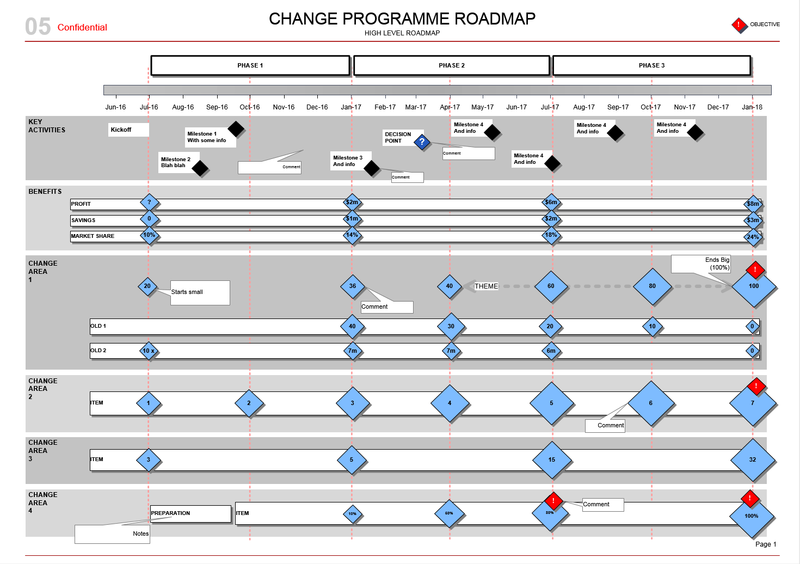 This Cultural Change Template will help you plan your organisation change. The important aspect of this approach is the FOCUS on PEOPLE and CULTURE. The Innovation Implementation Powerpoint gives you requirements, overview, methodology and resource planning to get innovation functioning in your business. This Innovation Project Proposal Template outlines a “People-led” Innovation Project. There are step-by-step instructions and notes to help you. Provide professional updates with this Innovation Project Status Report. Choose from 15 formats, & benefit from guidance notes. Clear & flexible templates. Four professional templates to help plan and present an Innovation Transfer Project. Move your Product Prototype through to Production “Business As Usual”. Use this Problem Statement Template to communicate your issue in 3-steps. The guidance and notes are focussed on making the case for an innovation project. This collection of Innovation Project Templates includes expert editorial guidance, & professional designs. Save now with the Innovation Project Toolbox.